The U.S. economy closed out 2012 with respectable job additions in December, culminating the year with hiring on par with 2011. The uncertainty created by the legislative impasse over federal taxes and spending likely restrained economic growth and job creation over the final months of the year, but the accord struck during the New Year holiday provides greater certainty on taxes at least. Left unsettled, however, are resolutions on spending cuts and the federal debt ceiling. A failure to resolve these matters soon may crimp economic growth and hiring through the early part of the year. Strong corporate profits, a resurgent housing market and healthy liquidity in the capital markets will offer positive momentum to economic growth during 2013, but the yoke of the federal government’s inability to resolve pressing issues continues to restrain the economic potential. Repairs to properties damaged by Hurricane Sandy supported the creation of 30,000 construction jobs in December and raised construction employment by 18,000 positions for the year. Building trades have now added net-new jobs for two successive years, and further hiring is on tap for 2013 as housing construction increases. Year over year, housing permits were up more than 30 percent in 2012, including a substantial gain in the multifamily segment. Although steady employment gains over the last two years have supported rising retail consumption, retailers may be particularly affected by provisions in the new agreement on taxes. The expiration of payroll tax reductions set in place at the beginning of the recession will reduce take-home pay for many households, potentially crimping retail spending. Another provision of the newly set tax codes increases the tax rate on capital gains from 15 percent to 20 percent for the wealthiest households. This change may trigger greater single-tenant net-leased investment as investors increasingly favor 1031 tax deferred exchanges. 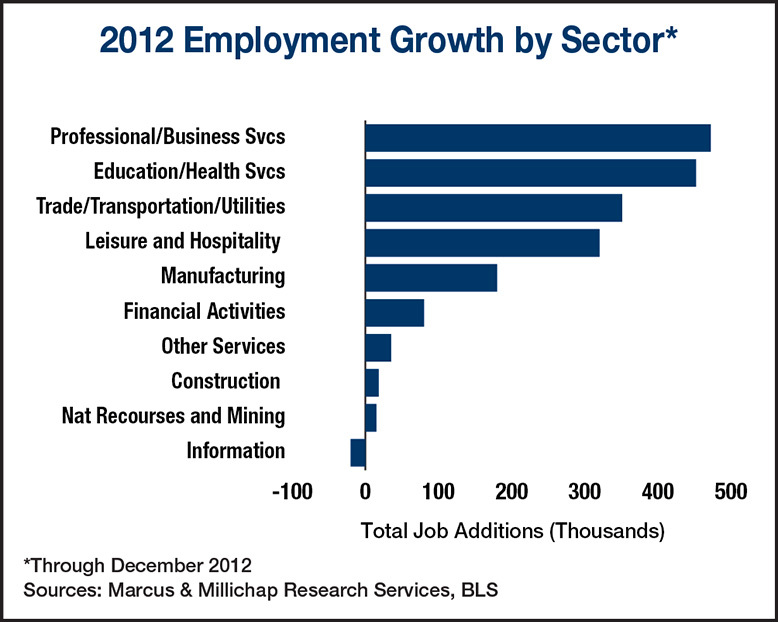 The national office sector remained on course to post a 20-basis point dip in vacancy in 2012 to 17.0 percent. More than 378,000 full-time office-using positions were added during the year, raising to 900,000 the number of such jobs created in the past three years. However, job growth has yet to translate into significant new space requirements for office tenants, but additional hiring in 2013 will encourage space users to seek larger layouts. During the year, vacancy will decline to the low-16 percent range. This entry was written by marcusmillichap, posted on January 5, 2013 at 12:42 am, filed under Research and tagged Commercial Real Estate, Employment. Bookmark the permalink. Follow any comments here with the RSS feed for this post. Trackbacks are closed, but you can post a comment. You do a great job of summing up the major points that affect the RE investor. Would you place my associates: Pat & Christina Rocke on Marcus & Millichap’s email list ?